Now with LED indicators (heartbeat, error, and programming) and ATtiny2313/4313 support! 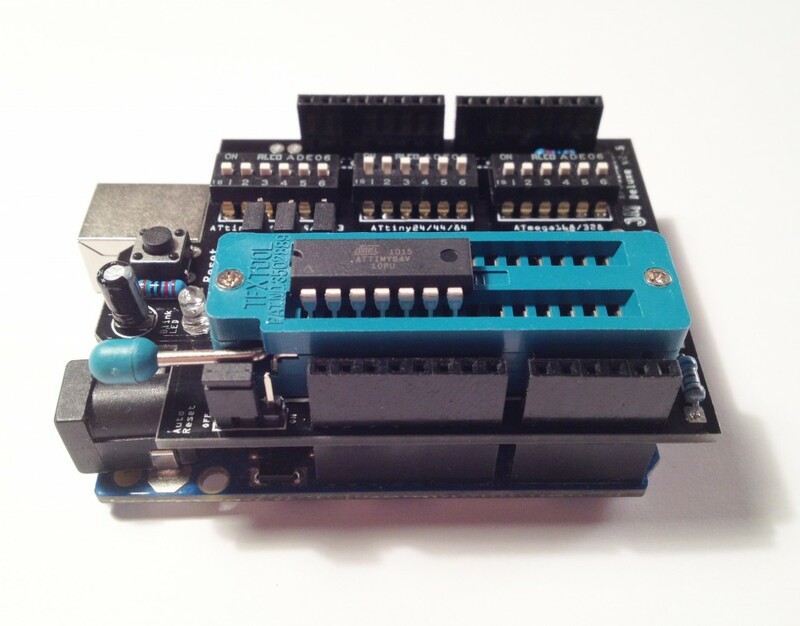 This is an update to an earlier project, the ArduinoISP Deluxe TinyLoadr Shield. Check out the original blog post if you haven’t already! If you’re just looking for the ATtiny hardware libraries, get them from the Arduino Tiny Google Code page. If you’re looking to purchase a shield, then head on over to Tindie! Since my first batch of shields did so well, I decided to tackle a couple design issues and add some new features to my ArduinoISP Deluxe TinyLoadr Shield. The first thing I did was modify the part placement so I didn’t need extra-long, special-order female headers to keep it from shorting out on the USB port. I would have been fine with keeping the extra-long headers if they weren’t so expensive (almost $5 for a set, eek!). Next, I added ATtiny2313 and 4313 support. The ATtiny*313 microcontrollers have a similar pinout to ATtiny*5 microcontrollers. With board space at a premium, I decided instead of using a new bank of switches, I could piggyback off of the first bank for ATtiny*5 microcontrollers and add a couple jumpers. Version 2.0 of the TinyLoadr Shield. For my third batch, I modified the board yet again. I removed the Blink LED pin selection, which allowed me to change the PCB shape for an even better fit on the Arduino Uno. I also changed the PCB colour to black and the green blink and indicator LEDs to blue. The end result is a product that both functions great and looks awesome. The latest version of the TinyLoadr Shield, programming an ATtiny84V using an Arduino Uno. Categories: Arduino, Projects, TinyLoadr. 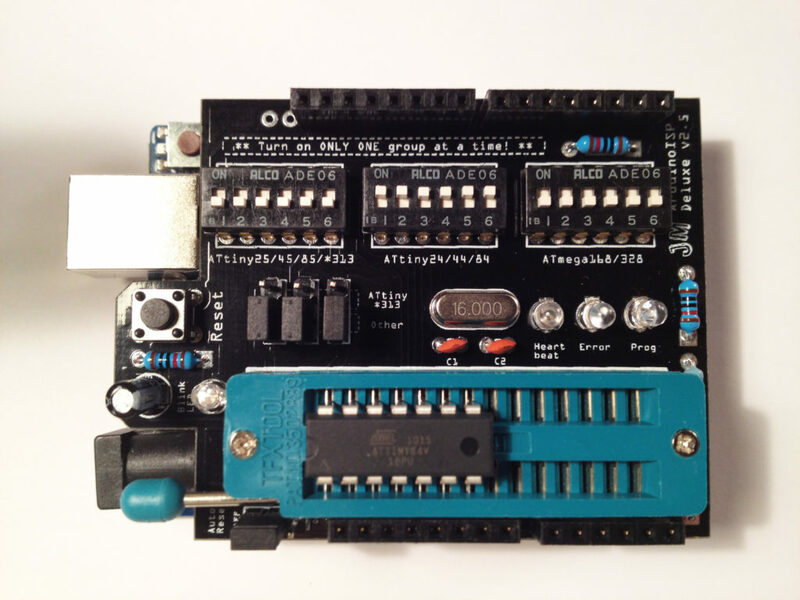 Tags: Arduino, ArduinoISP, ATmega328, ATtiny, featured. 7 Responses to TinyLoadr Shield Updated! 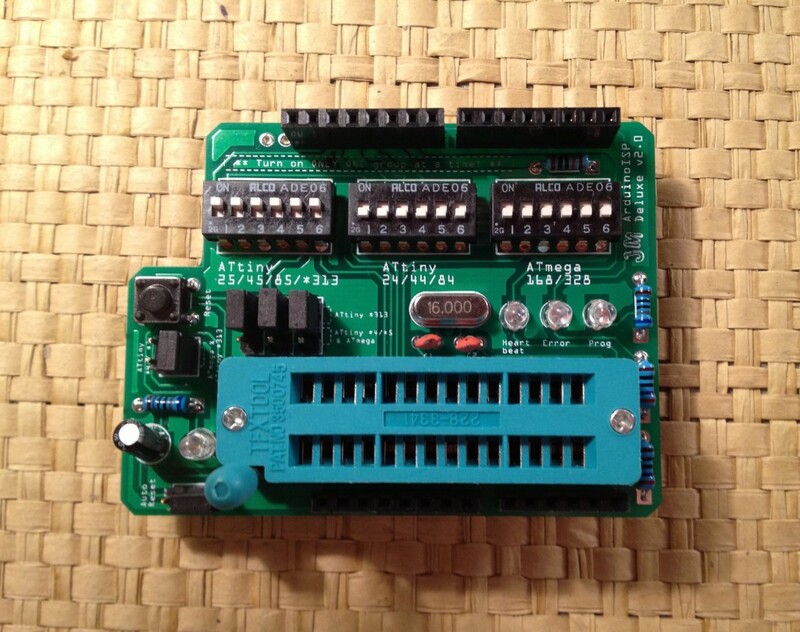 Do you only sell this item as a complete kit or can I purchase the circuit board by itself ? Hi there. Currently it is only sold with components. Your tindie page 404s. Please tell me you still have some of these left (or can make more?)! If not, I can always use your schematic on Fritzing, but it would be awesome if you still had some of these. It says out of stock right now, but I just received the last components I was waiting for in the mail, so they will be back in stock later today. What type of headers are you using? I’ve only seen the extra-long kind that look awkward. They’re standard 10.5mm stacking female headers, like the ones you would find on Adafruit or Sparkfun. The original one had to use longer ones like the ones used on the official Arduino ethernet shield. I changed the design because those headers were much more expensive.